We thought Red Bull KTM’s Ryan Dungey could be better in 2016 than he was while dominating in 2015—now we’re positive that’s the case. 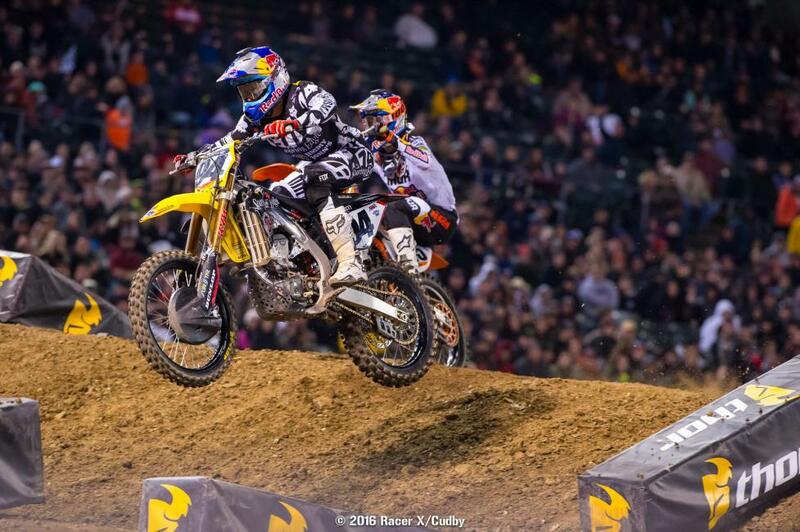 His Oakland performance, which gives him three-straight wins and makes him 2-1-1-1 in finishes this season, was another huge step, because Soaring Eagle/Jimmy John’s RCH Suzuki’s Ken Roczen got his first good main event start of the season, and got to second behind Dungey with just a 1.8 second gap to make up. Roczen was hauling and rode well, but he wasn’t quite as fast as Dungey, who really does look better than ever. Dungey just kept inching away until he had about a five second lead, riding nearly error-free and picking great lines. It was a strong performance on a tricky track for Dungey, who is absolutely the total package right now. Roczen started third, which is much better than any race this year, but took a few laps to get around Marvin Musquin for second. That gave Dungey a little breathing room, which was all the champion needed. 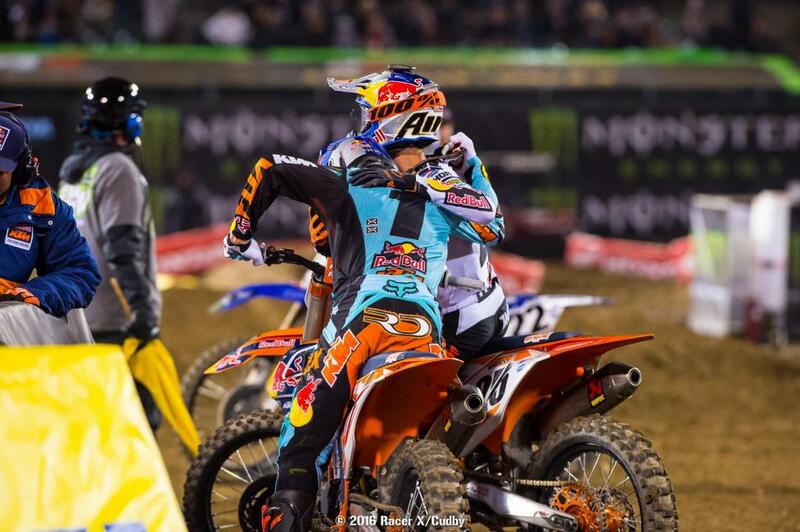 Roczen rode hard but couldn't quite match Dungey. Kenny is really, really good right now, but Dungey is reaching alien status. Musquin had gone 14-9-9 at the first three rounds, and then busts out a podium here. He rode well—not enough to keep Dungey or Roczen in sight, but he had a massive lead on everyone else. A great battle raged behind the lead three for fourth. 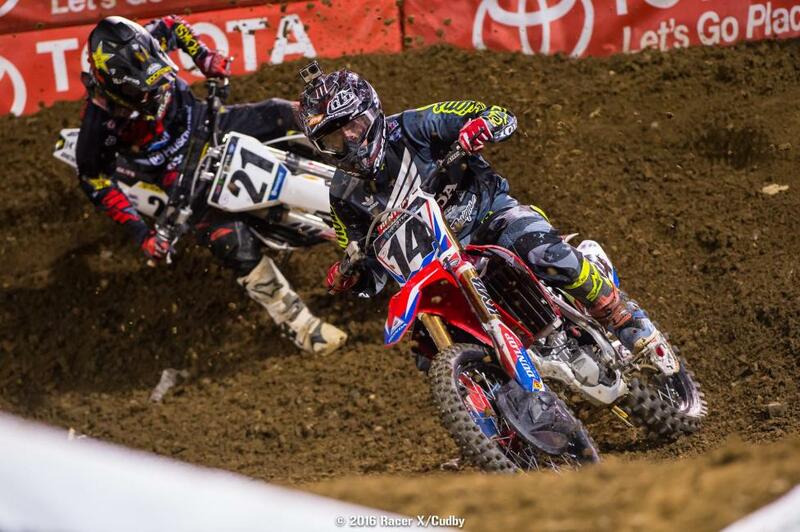 Cole Seely had that spot for awhile on his Honda HRC machine, but was under pressure from Chad Reed most of the way. Then Rockstar Energy Racing Husqvarna’s Jason Anderson came barreling through and got both. Anderson rode very well, but was done in by the start, which has pretty much been the case in every race this year (he even came from behind during his win at Anaheim 1). Reed was later able to overhaul Seely for fifth on his Monster Energy/360Fly/Chaparral factory Yamaha. Seely took sixth for the second-straight week, telling us he was fighting the track and the bike and got a little tired. The track was pretty demanding. It was wet while being moved into the building, and while covered during heavy rain, some of that water dripped back onto the track when the tarps were removed. That left the track soft and chewed up in spots. 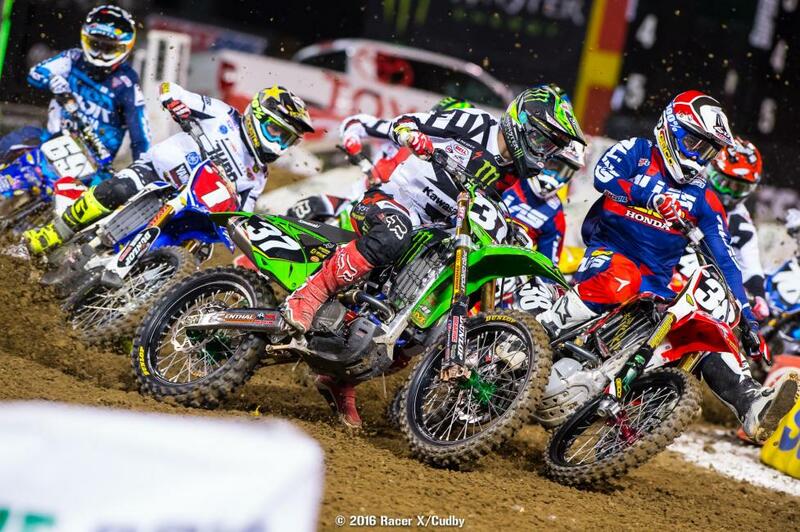 Eli Tomac was seventh on his Monster Energy Kawasaki, breaking his string of 4-4-4 finishes to open the season. Tomac won his heat race, so he looked good early, but started way back in the main and didn’t seem to have his customary speed. After the race, we spotted a big meeting going on between Kawasaki brass, Eli’s father John, and others. 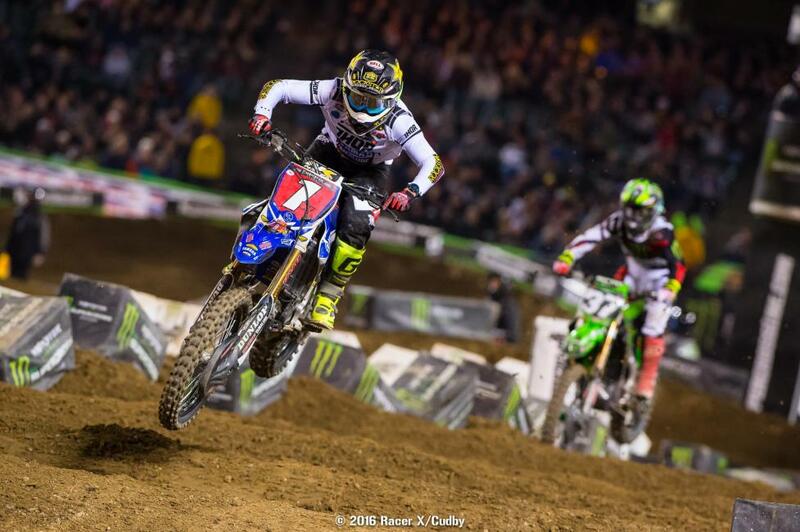 It certainly wasn’t the night the team and rider were hoping for after Eli looked to have podium-level speed last week. Weston Peick could have finished eighth last week, but he went down in a crash with Justin Brayton on the last lap. He could have had eighth this week, but went down in a crash all by himself on the last lap here. Weston bruised his chest and shoulder but should be okay. Cooper Webb’s win streak is over! Joey Savatgy wins! It looked like Webb could extended his streak to four-straight races to start the season, but then his bike suddenly shut off while he was leading. We stopped by the Star Racing rig at the end of the night and the team still wasn’t quite sure what had happened to Webb’s bike. Team owner Bobby Regan told us they wouldn’t know for sure until Monday, but right now they suspected the problem was electrical in nature. It looked like smoke was coming out of the engine as Cooper tried to kick it, but the bike eventually refired, Cooper did a lap to finish the race, and then the bike was ridden all the way back to the pits without trouble. Team Manager Brad Hoffman told us he thinks it might be the stator, because if raw fuel got dumped into the engine, it could mist out of the bike, which could explain the look of smoke. Webb said vapor lock on the podium, but Hoffman doesn’t think that’s the case, because EFI bikes with pressurized fuel systems virtually never vapor lock. Alex Martin, Webb’s teammate, went down while running third and DNF’d. He was credited with 22nd, Webb with 21st. Savatgy rode very well and kept Webb honest the whole way, even after landing on some tough blocks and bending a shifter. He could nudge the bike between first and second gear awkwardly on the start straight, but basically decided to just leave it in first and scream it around the track. When Webb’s bike expired. 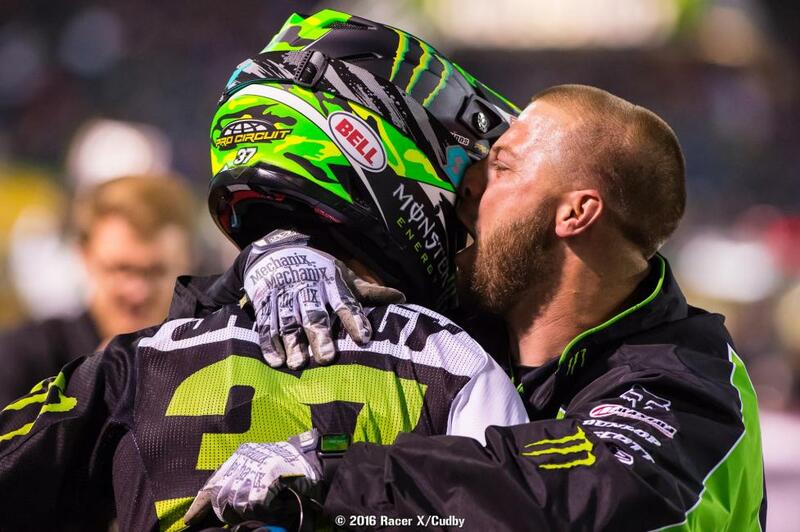 Savatgy cruised past for career SX win #1. He also takes the points lead from Webb by two points. Christian Craig is on the verge of something. He battled Webb a bit in his heat race but ended up second, then grabbed the early lead in the main and looked ready to do battle again—he was holding Webb at bay early without even dealing with much pressure. Then, suddenly, he lost the front end in a corner and went down. Craig got back to fourth, which became third when Webb crashed. That’s back-to-back podiums for Craig, but these weekends are turning into possibilities for race wins. 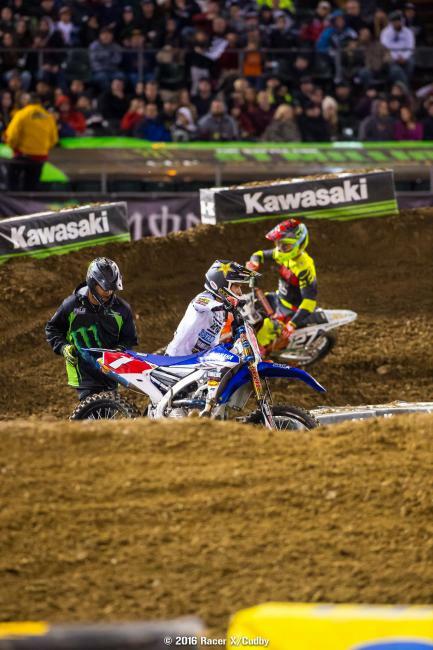 Not the return to racing James Stewart was hoping for after getting knocked out of the opener. The Yoshimura Suzuki rider looked good in his heat, battling with Eli Tomac, but after eight laps Stewart pulled off the track and headed back to the pits with his mechanic, Rene Zapata. We spoke with Zapata after the race and confirmed there weren’t any mechanical problems with Stewart’s bike—Stewart just wasn’t feeling 100 percent. Craig (38) got to lead more laps and looked even more relaxed up front than last week, but he crashed.